Why would you want to sew a onesie when you can buy one? Well, number one it’s made from the heart and number two its; unique. My nephew Jonathan is going to be nine months in a couple of weeks. 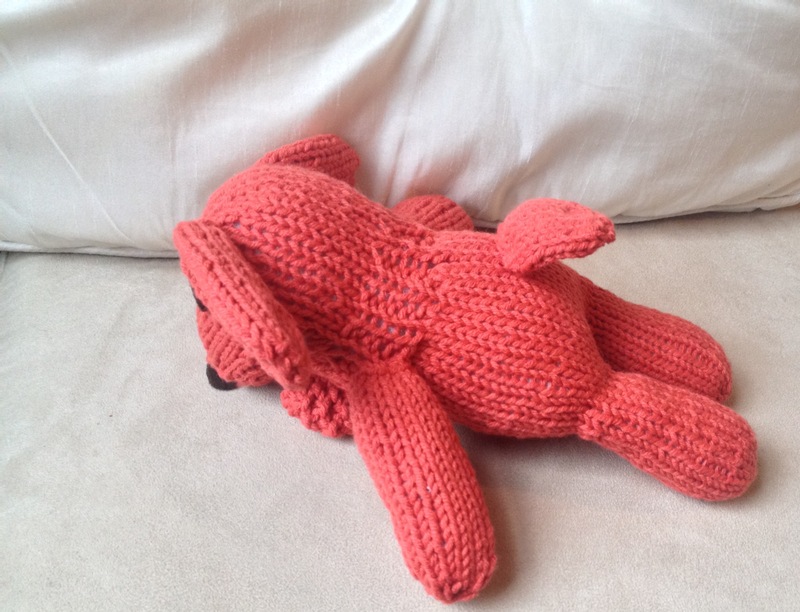 I wanted to make him something special and came across this pattern by Shwin & Shwin. It is called the Baby Ringer Onesie. You can download this free pattern. 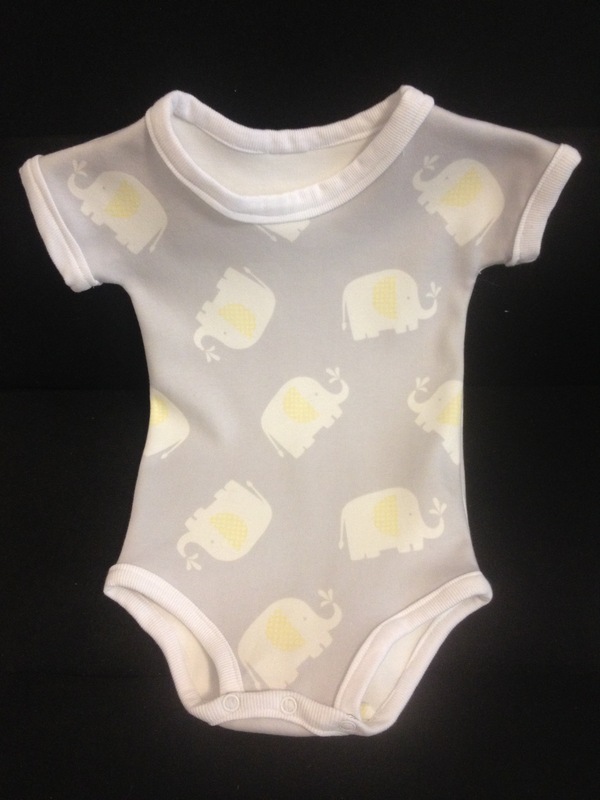 (sizes 3, 6 and 9 months) It’s just adorable! Now, let me tell you right now that this pattern requires a lot patience, especially when sewing the rib knit. It’s definitely a project. I was able to purchase all of my materials at my local JoAnn Fabric and Crafts Store. I can’t wait to deliver this gift and making more onesies. Thank You Shwin & Shwin! The king of my family is my 6-month-old nephew, Jonathan. You see we are a family of girls/women. He is the first boy in the family. Let me tell you a little bit about Jonathan. He has a smile that can light up a room. After holding him for less than 5 minutes your worries are gone. He is such a happy baby! 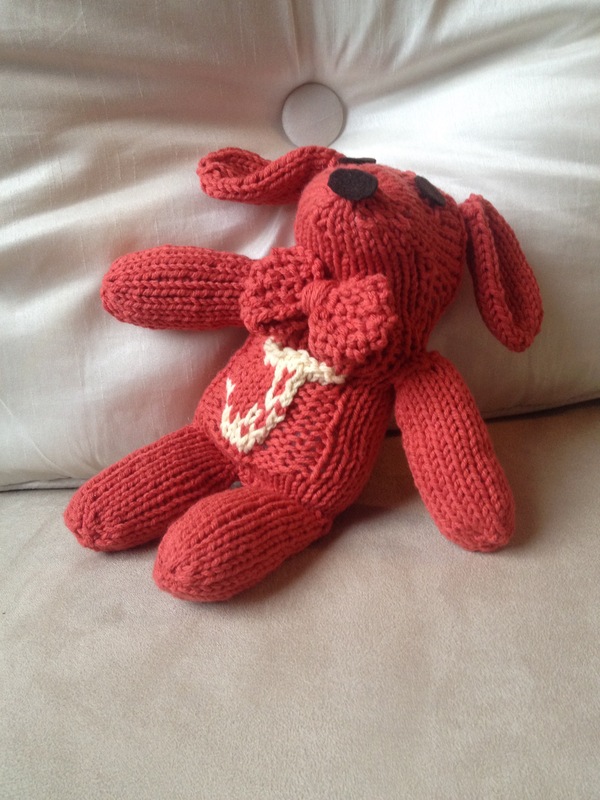 I wanted to knit him something special and found a dog pattern from the Lion Brand Yarn Company-Poochie Pup Sock Critter. You need to create a free account to have access to this pattern. I added my special touch by adding a bow tie, and adding his initial. The Alphabet Chart is from Little Cotton Rabbits. The yarn is Cotton Ease, also from the Lion Brand Company. I truly enjoy knitting this dog pattern. I visited a friend’s house and saw a glass jar in her kitchen. I fell in love with it and I was on a mission to find this jar. Finally, I found it at Target. I was so happy to finally find this jar. I immediately put jasmine rice in it. It was an immediate accent piece in the kitchen. Unfortunately, the lid for the jar broke a couple weeks ago. I went to target and couldn’t find this jar. I went to Homegoods, Marshalls and T. J. Maxx but I couldn’t find a jar similar to the one I have. I didn’t want to throw away the jar just because the lid was broken. So, I decided to crochet a lid. I just love it. I didn’t have a crochet pattern. I made it up as I went along. The yarn I used is from the Lion Brand Yarn company-Cotton Bamboo. It’s machine washable and the lid fits like a glove. 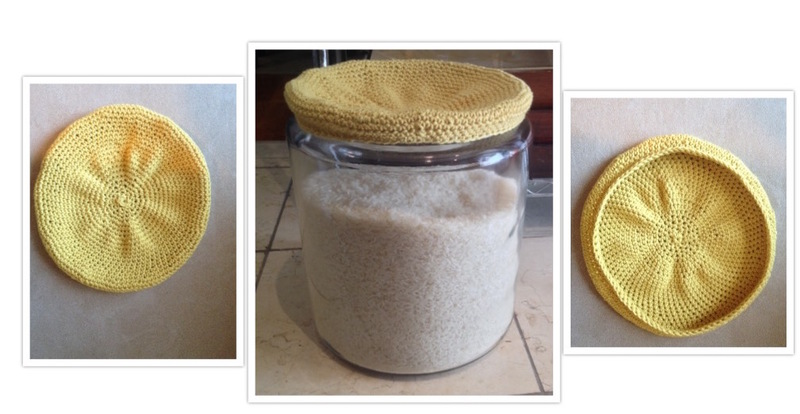 Below is a free pattern to crochet lid for a jar. Even if your lid is not broken, it’s a quick project to add a touch of color to your kitchen. Repeat rows 2-3 until the pice measure the width of the lid. Well, I just love dishcloths. It is a necessity in the kitchen. 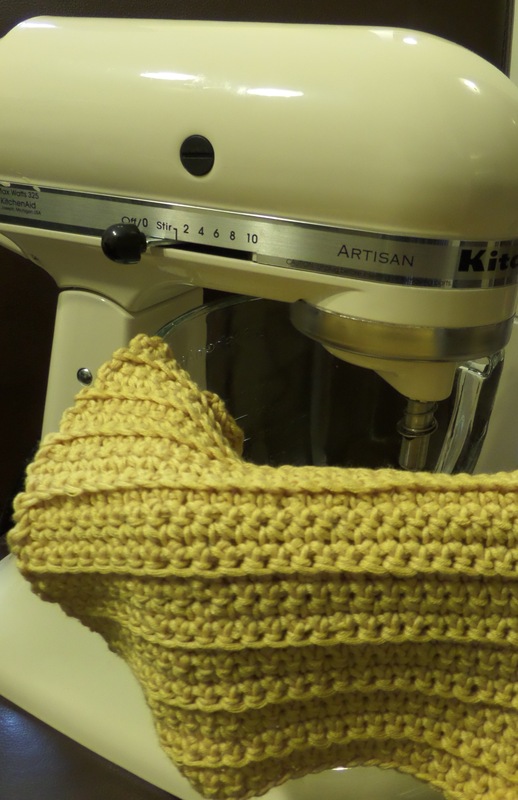 Although it is a necessity, you can add a little color to your kitchen crocheting your own dishcloth. The key is to use 100% cotton yarn, or a cotton blend. I decided to use Lion Brand Yarn’s Cotton Bamboo which is a cotton blend. The reason I chose this yarn is the variety of spring colors that are available: magnolia, persimmon, hibiscus, hyacinth and gardenia; to name a few. Below is an easy dishcloth pattern. Row 1: Skip the 1st chain and sc across. I truly enjoy crocheting a monogrammed gift. Adding an initial on a crocheted gift gives it a special look. It is unique. 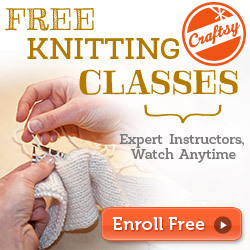 As the weather is changing, so does my crocheting and knitting. I crochet/knit small projects with lightweight yarn. I decided to crochet dishcloth using Lion Brand Yarn Cotton Bamboo. It is a set of three dishcloth with one monogrammed dishcloth. 1- Select an alphabet chart pattern. Here’s an example of an alphabet chart pattern. 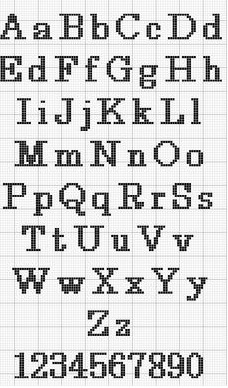 2- ChemKnits has tons of alphabet chart patterns. 3- Count how many stitches it would take, to crochet the letter (for example 6X20 (six stitches and 20 rows). 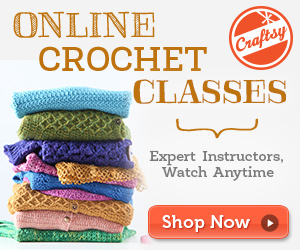 This is very important depending on what you are crocheting. You can visualize how small/big the letter will look in your project. 4-Decide where you want to start the initial. 5-The key to monogramming a crochet stitch is to use the puff stitch. Crochet a puff stitch every time you see a black square on the chart. Please share any project you have created. The possibilities are endless when it comes to monogramming!